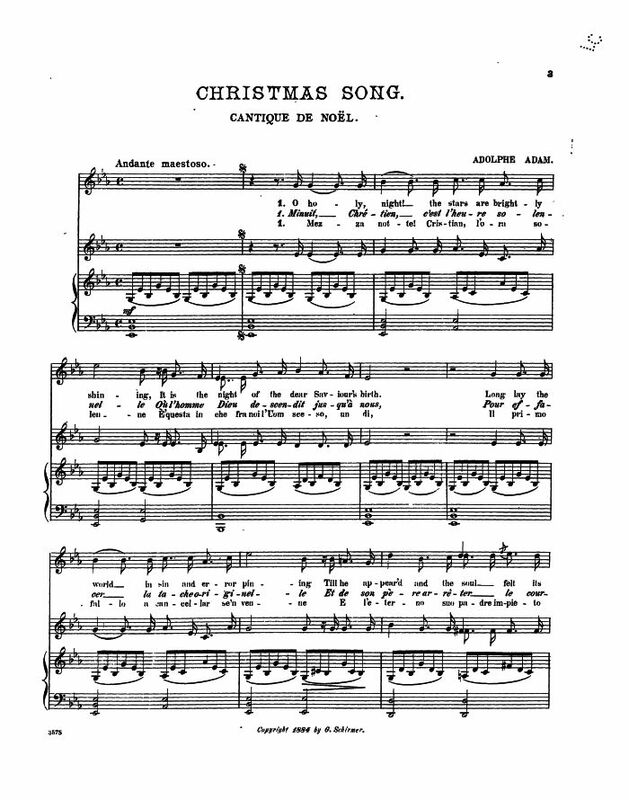 Translated to English as O Holy Night by John Sullivan Dwight (1813-1893). Cappeau, a wine merchant of Roquemaure, France, who wrote poems for his own enjoyment. Dwight was editor of Dwight's Journal of Music. This literal translation was provided by Todd Victor Leone. 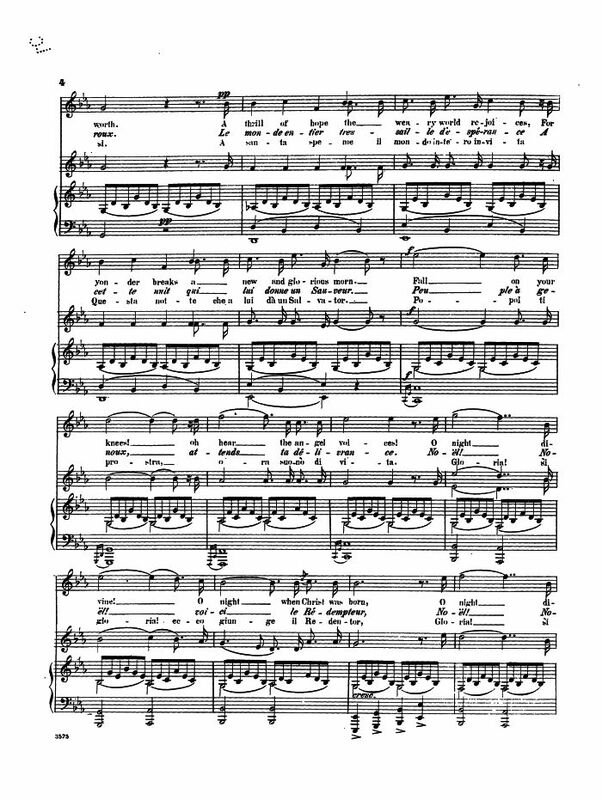 and his many other operatic and theatrical works. People, on your knees, attend* your deliverance. * Sue Hartman, a friend of the site, suggests that "attend" in verse 1, line 7, be substituted with "await," making this line "People, on your knees, await your deliverance." My thanks to Sue and Gordon for helping us better understand the message of this carol! There are additional comments concerning this carol below. 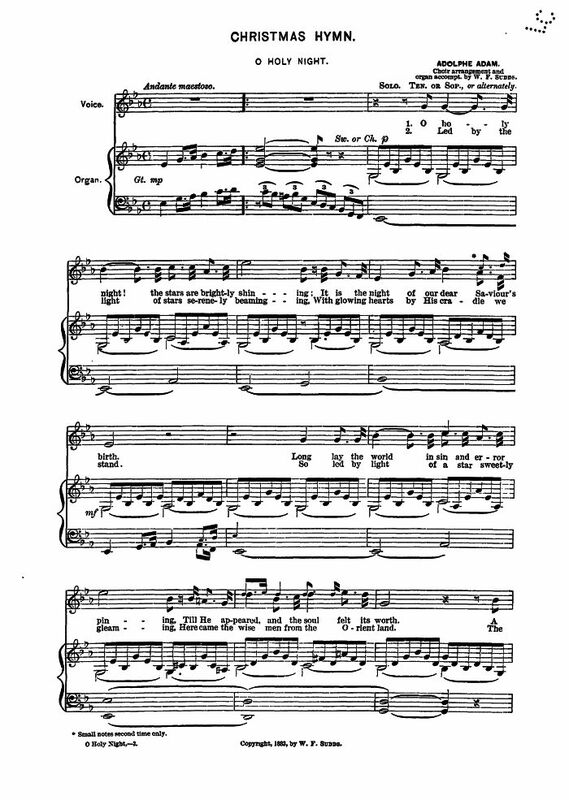 Also using this tune is Oh Solemn Hour! When Hearts Were Lowly Bending. 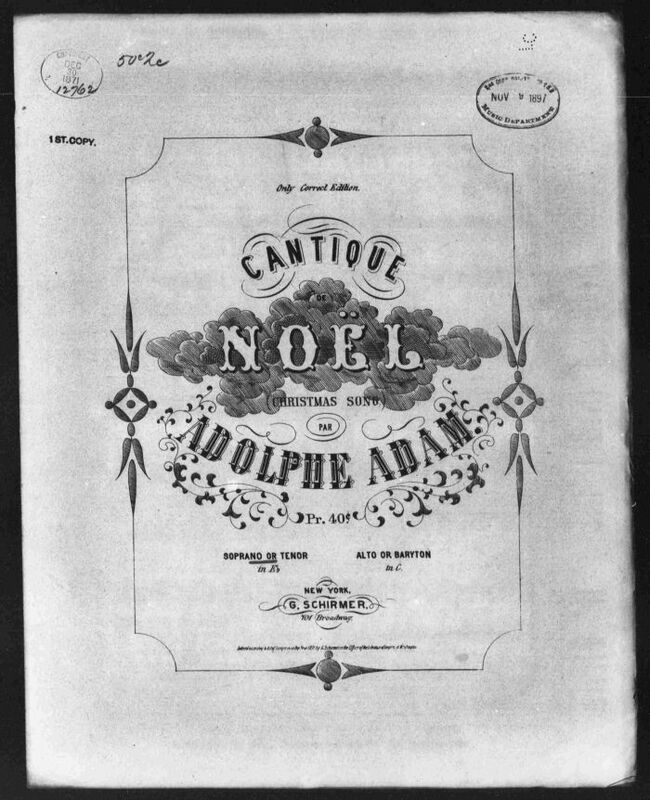 The Choral Public Domain Library (CPDL) has a number of arrangements at their site in English, French and Portuguese; see O Holy Night. 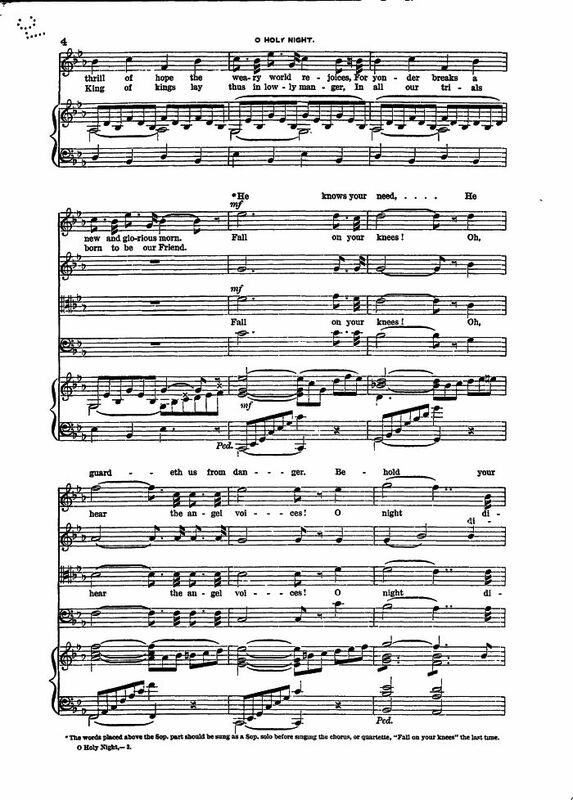 I dragged out my sheet music for "O Holy Night" today, which contains all three verses as translated by the Rev. John Sullivan Dwight. 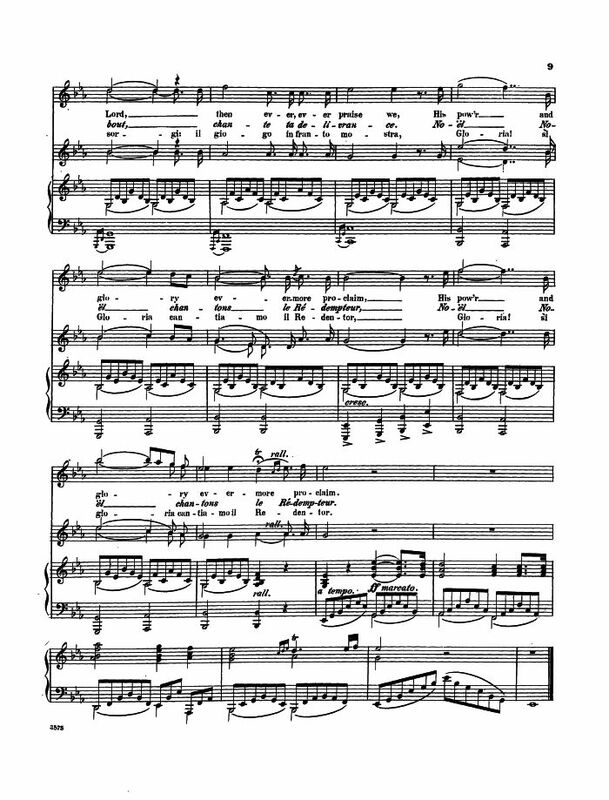 I then realized that it also has all three original verses in French by Placide Cappeau. 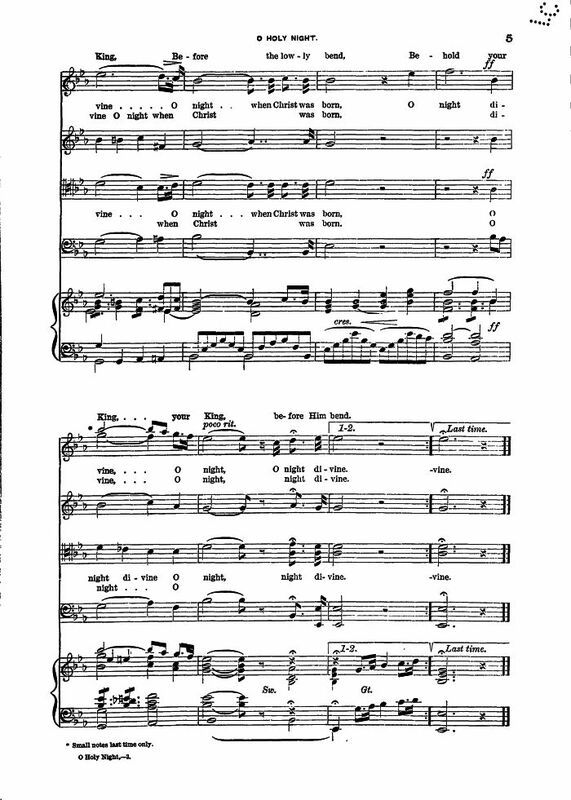 I note that the Hymns and Carols of Christmas website only gives two verses by Cappeau (same as those at the Cyber Hymnal, hymntime.com/tch) and that the missing middle verse is very hard to find on the Internet. Searching on some of its exact French lyrics using Yahoo! brought up a couple of French-only websites that have all three verses. As I was working on a literal translation of the original French — with a minimal amount of interpretive translations needed for clarity — I added the missing second verse to my efforts and did my best to translate that. My high school French is somewhat rusty and I had to get out my French-English dictionary, and I compared my work to a literal translation found on the 'Net of just the two verses you listed. I think it's a pretty accurate translation, but I'm no scholar of the French language, just an amateur. I point out, as one example, that "les chefs" is not usually translated as "the Magi," but, here, it refers undoubtedly to the "Wise Men" or the "Three Kings," and the only single word I know that gets the point across in translation is "Magi," so I used it. Sometimes, being exactly literal, word for word, just doesn't work. There are also idiomatic expressions that need to be translated as such with equivalent idiomatic expressions because a word-for-word translation of those doesn't work. "Courbez vos fronts" is literally "Bow your foreheads," but I thought it better to use "Bow your heads" because the phrase itself is an exact translation if not the individual words. I thought you might want to include verse 2 on your website in French — my literal translation may not be good enough for publication. But you can see how the French verses absolutely do correspond to the Rev. Mr. Dwight's free translation and he did include Cappeau's ideas, for the most part, in the English words. I note, for instance, that the third verse by M. Cappeau clearly refers to the idea of the slave being a brother, in the eyes of Christ. All in all, I think Mr. Dwight's work was excellent. Some male chauvinist of the past came up with this saying: "Translations are like women: if they are faithful, they are not beautiful and, if they are beautiful, they are not faithful." I don't agree with his sexist choice of metaphor, but, overlooking that aspect of the axiom, the point is nonetheless well taken. I think Dwight's translation [O Holy Night] is beautiful, and reasonably faithful. Comparing the literal meaning of "Minuit, Chrétiens" to "O Holy Night," verse for verse, is to me quite interesting.... I suspect that much of the imagery in "O Holy Night" may have been very inspiring to Dwight on a symbolic level that was nonetheless very powerful in the way it instructed his faith. To that, I can absolutely relate. My sincere thanks to Mr. Leone. I hasten to add that his high school French is infinitely superior to my high school French (which was none too good, even 40 years ago). Lacking access to a definitive source for the original lyrics, I cannot say which of the three (if any) are correct. 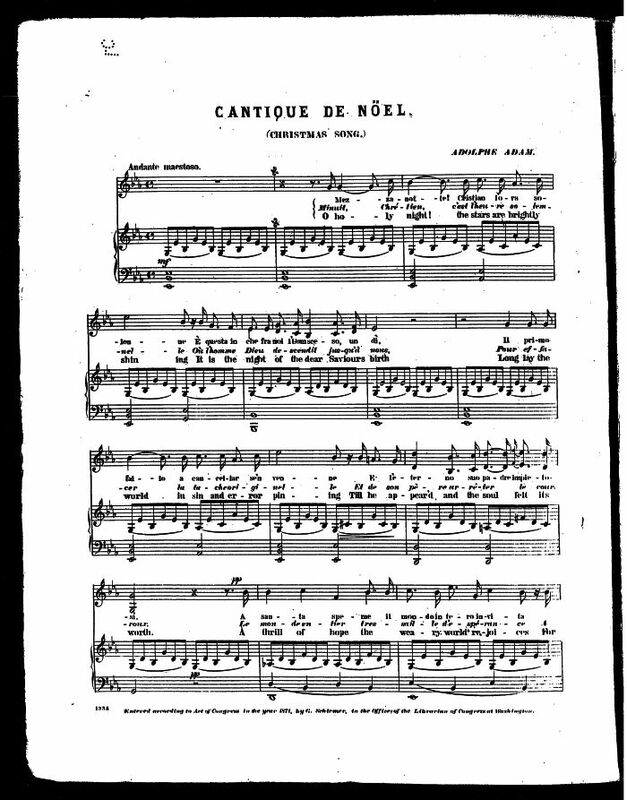 The 1871 sheet music, above, gives: à votre orgueil c'est de là qu'un Dieu prêche. I conducted further research, but was unable to find any further information of note. 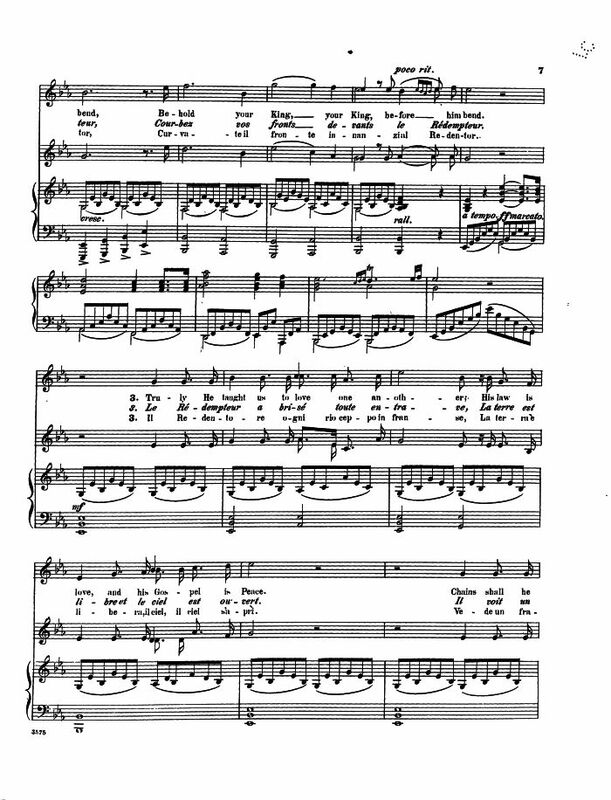 I just wanted to add a couple of comments about the original French song "Minuit Chretiens or Cantique de Noel" and point out a minor typo in the 3rd verse. C’est pour nous tous qu’il naît, qu’il souffre et qu'il meurt. The 'qu'il' is required in French for all three relative clauses. In English we can leave out the relative pronoun to avoid repetition, but in French it is mandatory and when it is sung all three are articulated. Love unifies those that were chained in iron." In the fifth line I would say the verb "enchaînait", (from the verb enchaîner- to chain up/attach) which is in the imperfect (past) indicative tense, indicates to me someone who used to be in chains, perhaps the chains of a slave. 'Le fer' can be used to describe a sword but its primary meaning is 'iron' and l'epée is usually used to denote sword. 'Les fers' (plural) is used as an expression to describe the "chains" used to attach prisoners. Anyway, I just wanted to put that out there and maybe help add to the website. I'm no French expert but I've studied it quite a bit for six years now and have always been infatuated with this song and the meaning it carries, both in the original French and the English translation, which are different meanings but equally compelling messages of hope and redemption. My thanks to Mr. Tinsley for his contribution. 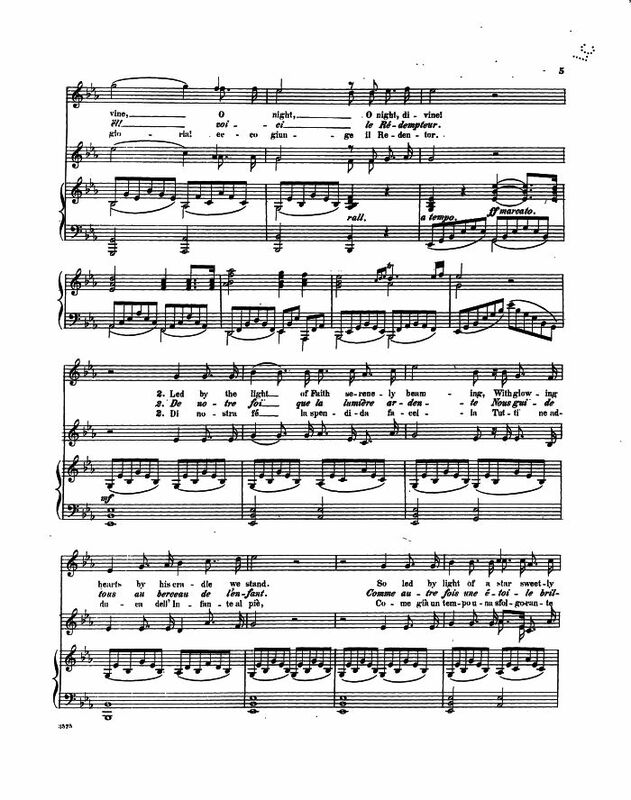 Again, lacking access to a definitive source for the original lyrics, I cannot say whether or not M. Cappeau included this "qu'il" in the sixth line of the third verse. 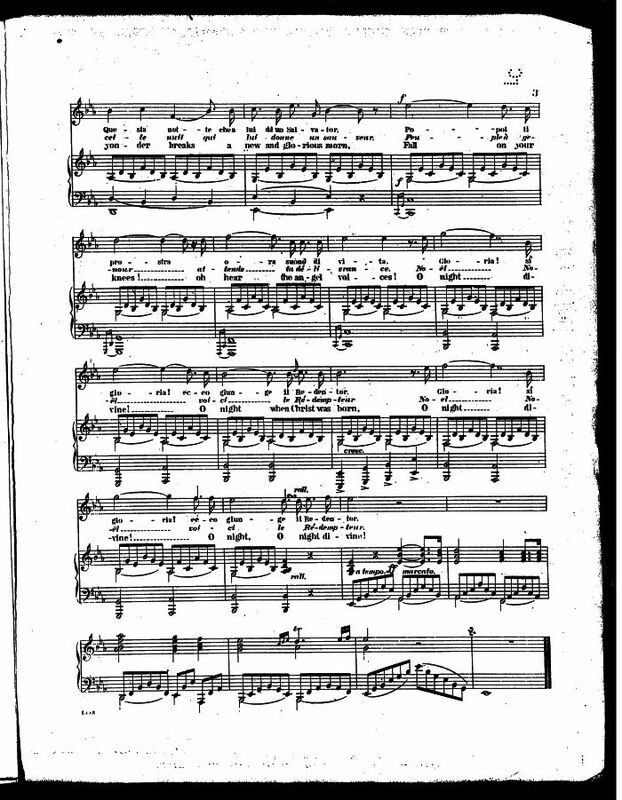 The 1871, 1883 and 1884 sheet music, above, does not include the third "qu'il" in the sixth line. 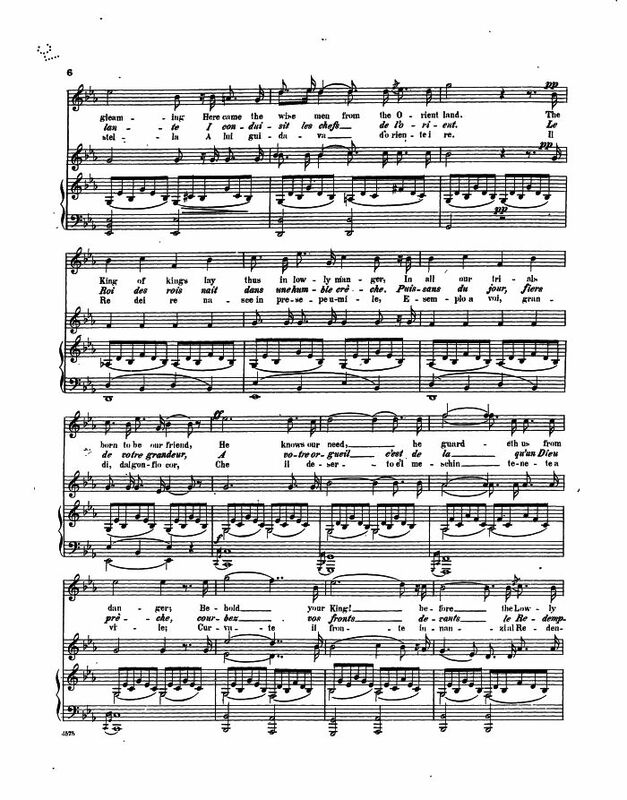 It is also omitted in the French versions found The Complete O Holy Night, described as containing "eight versions of the Christmas classic collected in one volume." It was published in 1993 by Hal Leonard Pub. Corp; all arrangements are contemporary. It should be noted that English lyricists often take liberties with the language when composing lyrics, and I can only assume that French lyricists do the same. In addition, languages evolve, and this difference may be accounted for on that basis (1847 vs. 2006). I too have been intrigued by the real meaning of "qu'enchainait le fer," and not been really happy with the various translations. In desperation I put the words into BabelFish, which is surely a last report for most people, and was stunned! Although the translation is clumsy - "The love links those which iron connected" - it is the first one I've seen to notice that "le fer" (not "ceux") is the subject of "enchaînait", which has, after all, a singular ending (otherwise it should be "enchainaient"). What's more, "links" seems to me the perfect way to translate "unit" because the sense of the line is surely that those who had been linked by iron chains are now linked by love. In French, you could also write "L'amour unit ceux que le fer enchaînait" - as Hugh Farey pointed out, "fer" is the subject and would usually come before the verb except when artistic expression might require it to come after - as Cappeau has written. In English, the translation is "Love unites those who were once chained in iron". (Literally, "Love unites those which iron once chained"). 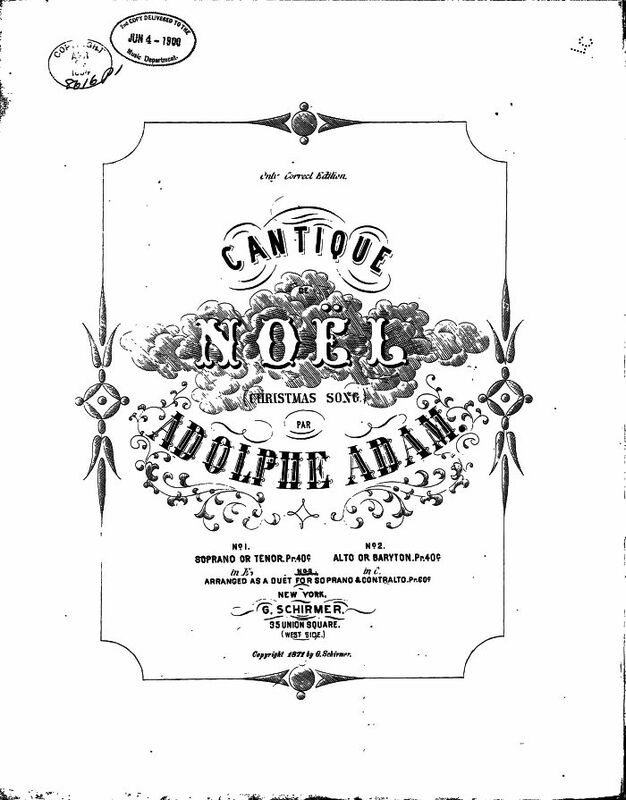 Another free English translation of Cantique de Noël can be found at About.com: Cantique de Noël (http://french.about.com/library/blxm-minuit.htm ; accessed February 4, 2007). 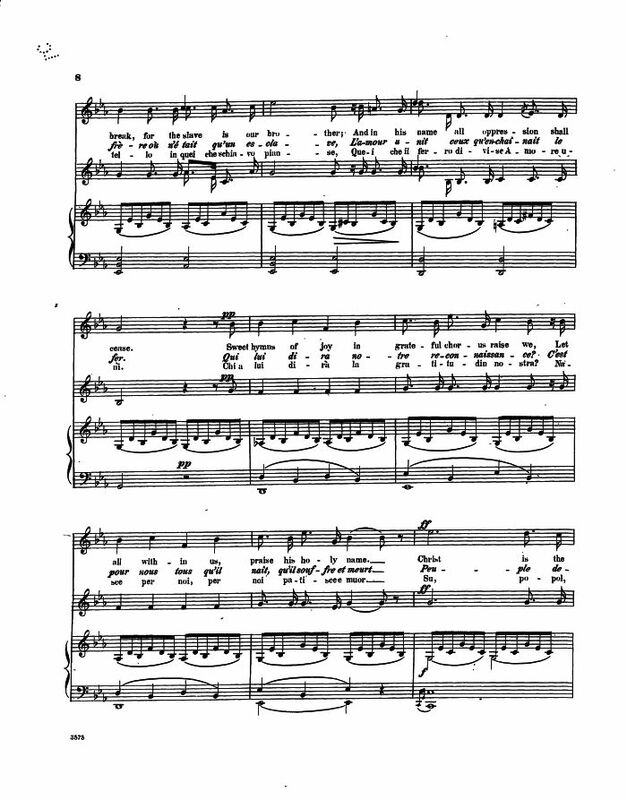 All three French verses can be found at the Wikipedia article on "O Holy Night", (Wikipedia contributors. "O Holy Night." Wikipedia, The Free Encyclopedia. Wikipedia, The Free Encyclopedia, 3 Feb. 2010. Web. 22 Feb. 2010. <http://en.wikipedia.org/wiki/O_Holy_Night>). 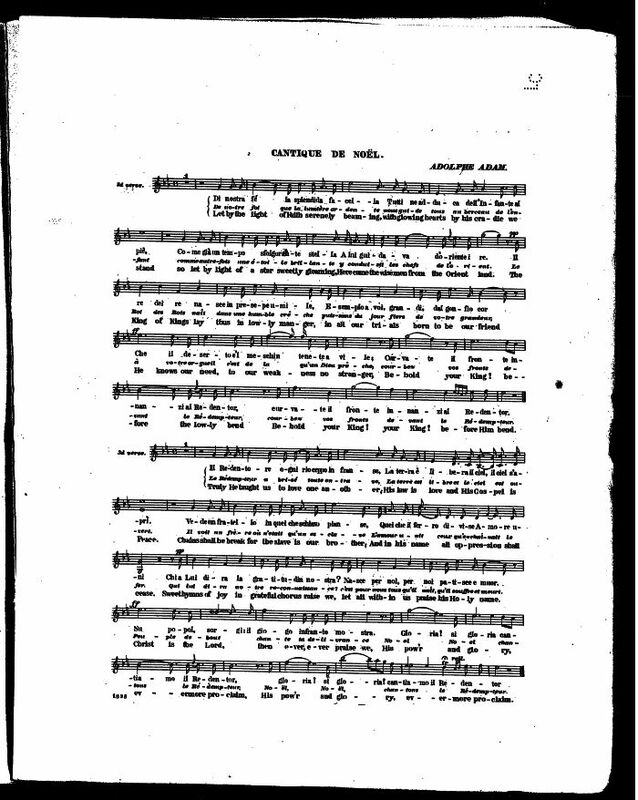 The English translation, O Holy Night, contains additional notes concerning the history of this hymn.